There’s no time like the present to get together with friends and family. And today we give you a good excuse to host you next get together. This recipe is easy, fast and full of flavor. Besides, who says no to a tasty taco? 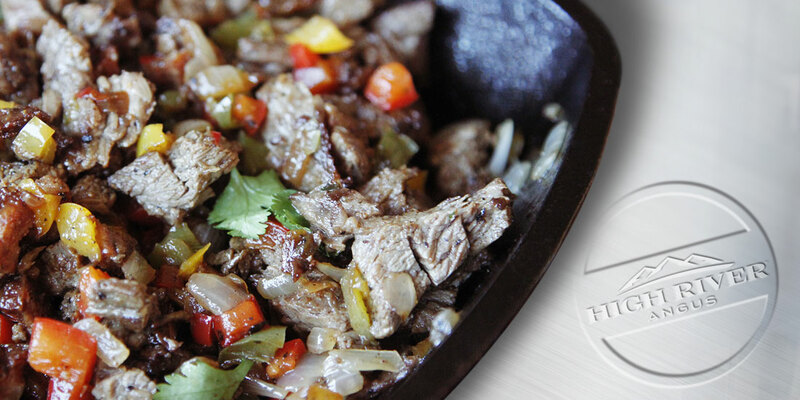 This Parrillada is made with High River Angus® skirt steak, marinated in beer and seasoned with spices and vegetables, including the spicy flavor of our Smoky Ridge™ Chorizo. In a medium bowl, place the steak with the beer and a tbsp. of salt. Cover and place in the refrigerator to marinate for 1 hour. Peel the chorizo and cut into small pieces. Set aside. On a large skillet heat the oil and sauté the onion until translucent, about 2 minutes. Add the bell pepper and cook for 5 minutes or until soft. Stir occasionally. Heat the BBQ or a cast iron grill pan over the stove. Cook chopped chorizo for about 5 minutes or until done. Grill the steaks, one at the time. It should take about 2 minutes per side, depending on the thickness. Slice the stakes into thin strips. Add the chorizo to the steak strips. Add the veggies. Add garlic salt and pepper to taste. Cook for two more minutes. Prepare the tacos adding your favorite salsa and lime juice, if desired.